The Visage hairpiece/wigs specialists have great expertise in the selection, fitting, styling and care of hairpieces and wigs, whether chosen for style or to remedy hair loss as a result of cancer treatment, from other medical conditions, or just from thin or thinning hair. We have great samples in all styles and colors, made with natural human hair from the best manufacturers. Our room in the back of the salon is reserved by appointment for private and confidential consultation. Walk-ins are welcome, but only if the room is unreserved and one of our specialists is available for a consultation – not impossible, but a rare occurance. We have a large selection in stock, and we can order many items quickly. We can help you design a custom order so you can avoid making costly mistakes. Once your selection arrives we can teach you how to secure and care for it and even work with you on styling. We have color charts, samples and all the accessories to make your hairpiece and wig selection a positive experience with the best outcome. Please call to schedule a consultation with one of our specialists so we can discuss your needs and show you what is available and how it all works. 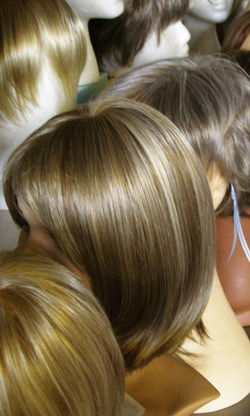 Your insurance policy may cover the costs involved in purchasing hairpieces and wigs. Try to find out what those options are before making your purchase and discuss it with one of our specialists. There are also grants available for those who need but can’t afford hairpieces or wigs and whose insurance does not cover them. Ask one of our specialists for details on researching such grants.